Memorize it: Learn each poem quickly and forever! AudioBrain Poems is a uniquely designed memory development technique based on listening to the world's classic poetry by Shakespeare, Pushkin and Cervantes, professionally read by native speakers. Stimulating the underactive brain regions responsible for processing audio data the application takes your perception of any information to a new level. got an image of the entire poem in front of your eyes to recite it as if reading from a book. Repeating any information aloud multiple times stimulates the brain region responsible for the audial perception of information. As we grow older, we use this brain region more and more rarely. This leads to its stagnation; as a result, the brain region responsible for the visual perception of information becomes dominating and our capabilities for audial perception of information become noticeably weaker with age. AudioBrain Poems aims at rectifying this imbalance by helping you develop skills for quick processing and remembering of audial information, which raises your level of perception. This application is based on a technique which does not displace the visual perception of text information but rather complements it, actively stimulating the brain regions responsible for verbal communication. The great advantage of this application is that it keeps your brain in a state of constant engagment, thanks to a specially developed system that gives it a minimal rest, making it able to adapt to situations and environments it has not been in for a long time, if ever. When was the last time you concentrated 100% of your attention for one hour? AudioBrain Poems has a lot of cool features you probably don't know about. We added a bunch of ideas in our app and we want to share them with you. Don't forget that AudioBrain Poems is not an entertainment app, like a game, it's a memory development application. Easy navigation. All poems grouped by languages and authors and sorted by difficulty. Initial app size is less than 16 MB! Download only the poems youn need and follow your progress with a lot of achievements. Narrated by native speakers in a professional recording studio. 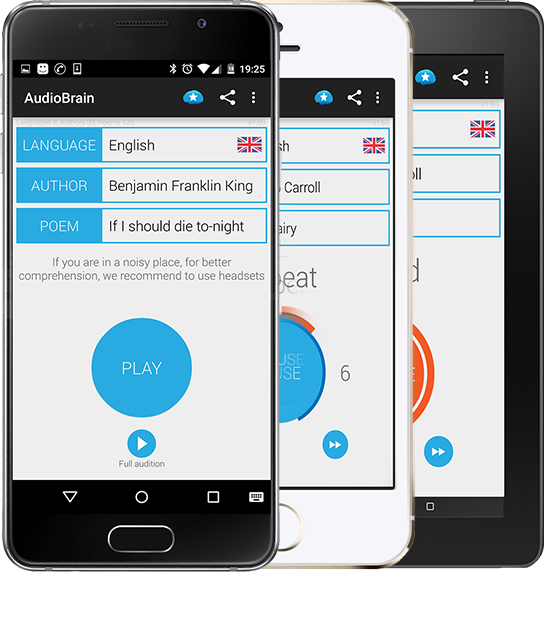 AudioBrain Poems is optimized for android and apple mobile phones and tablets. "Amazing and lovely app! I am very satisfied with the effort put into creating this app, It is very nice to listen and recite the poems while doing art just to have something to listen to and I look forward to using this app in my spare time!😊 But I do have some feedback, even though this is a app to strengthen your auditory skills, it would be nice to include the actual text with the poem just to make sure you are saying the correct words. (I am learning Korean)." "This app is wonderful! You've enriched my world and ignited my long lost love for languages. Thank you!" "Follow the recommended directions and you will be quite impressed with the effort and creative minds behind this app....maybe with yourself as well:) Wonderful Job...looking forward to more from you guys.."
I don't really rate or comment on apps, but the sheer quality and effort put in by the producers here is incredible. I strongly urge you to buy the full version to support the excellent work being done by the creators."